Tullio Hermil is a Nietzschean superman: handsome, intelligent, and powerful, he believes himself to be superior to other men and beyond the reach of their judgment. A dandy and an aesthete, Tullio is repeatedly unfaithful to his loving and innocent wife Juliana, who bears his ill-treatment and infidelity with patience. At last, growing weary of his debauchery, Tullio decides to attempt a reconciliation with his wife, but he is horrified to find that, in a single weak moment, Juliana has succumbed to the advances of another man and has gotten pregnant. And when the baby — the Intruder — arrives, Tullio begins to contemplate an unspeakable crime that will lead to deadly results. 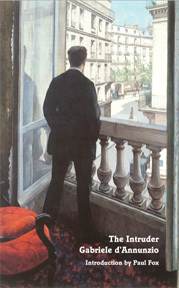 First published in Italian in 1891, The Intruder (L'innocente) was controversial because of its questionable morality. The present edition reprints the rare unabridged 1898 American edition translated by Arthur Hornblow, rather than the more commonly reprinted bowlderized British translation of 1897. Although initially recognized as a giant of modern European literature, D'Annunzio's reputation has suffered much from his ties to Mussolini's fascism, and it is to be hoped that this edition, which features an original introductory essay by Paul Fox, will lead to a rediscovery of his works.